The County Planning Commission will be taking up the Nova Wine Warehouse use permit application at their May 1, 2019 meeting. 400,500 sf with parking for 263 vehicles and 20-40 new employees looking for housing. Less-than-significant impacts according to staff, as usual. 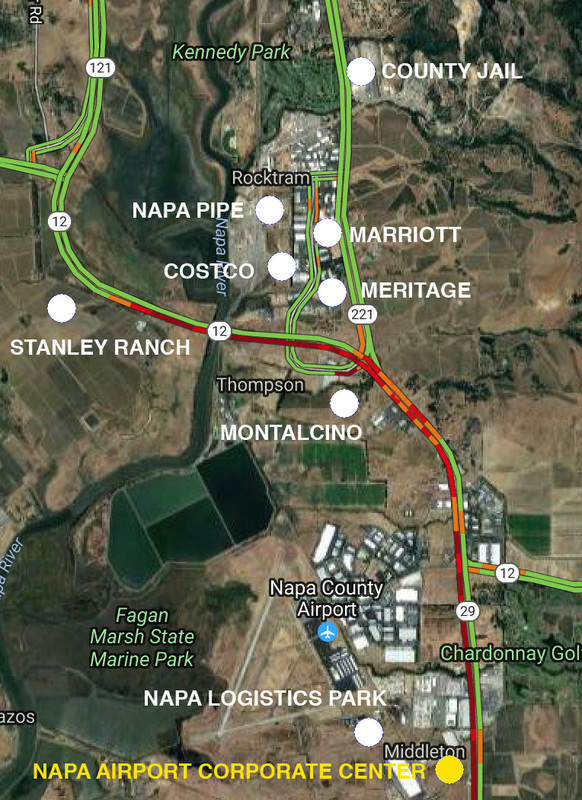 The American Canyon Planning Commission has just approved another bunch of warehouses that will generate 4900 more trips per day to add to the traffic jam through American Canyon and south Napa that is Bottleneck Junction. Along with Napa Logistics Park it will clog up the S. Kelly Rd intersection to match the Jameson Canyon intersection. The project will also, incidentally, increase the cancer risk for American Canyon Residents! "Air quality impacts remain significant and unavoidable:"
-"The operational emissions from the total project evaluated in the EIR exceed the Bay Area Air Quality Management District’s (BAAQMD) thresholds of significance for Nitrogen Oxides"
-"A community health risk assessment was prepared because of the proximity of two residences to the project site and found that the increase in cancer risk because of the project construction and operation exceeded the BAAQMD significance threshold"
-"Project Greenhouse Gas (GHG) gas emissions would exceed the BAAQMD threshold of significance"
"Transportation impacts remain significant and unavoidable:"
-" The addition of Project traffic to existing conditions would result in the  following intersections operating at unacceptable level..."
-"The addition of Project traffic to existing conditions together with other pending projects (background development) would result in the following  intersections operating at unacceptable levels..."
-"The addition of Project traffic to projected cumulative traffic conditions would result in unacceptable levels of service at 13 intersections"
-"the proposed project may conflict with the Napa and Solano County congestion management plans"
-And "While improvements have been identified to address these impacts, most of them are under Caltrans jurisdiction and funding and plans have not been approved. Therefore, there is uncertainty about whether the improvements would be implemented, so the impacts remain significant and unavoidable"
"7. The Project will facilitate the logical and orderly development of the Devlin Road corridor in accordance with the City of American Canyon General Plan and Napa County Airport"
"10. The Project will contribute to the long‐term fiscal health of the City by generating new taxable sales, development impact fees, business license fees, property tax, and other sources of revenue." Development doesn't pay for itself. It doesn't. [If] you are looking at Napa Pipe now in south Napa, where a developer again is circulating memos showing how much profit it would generate, the profit might be actually true but it isn't really profit, because the cost items are all left out, whether it's traffic, clean air, noise, health, education and other items [concerning] social welfare. Residents of American Canyon, the County and the State will end up subsidizing this project through increased taxes and bond measures to pay for the infrastructure and service costs that are never covered by the project's mitigation fees. Again ask yourself, do big city residents pay more or less in taxes to support their government? Are large cities fiscally healthier than small towns? Will the city end up spending more to maintain and service 30 acres of industrial development or 30 acres of wetlands? The city is already desperate (with a $1.2 loss in 2016) for the revenue generated by this project to help pay for the long term burdens of previous urban development. How much will residents have to pay for the road widenings, and intersection upgrades and eventual freeways needed for the thousands of additional daily vehicle trips generated by this project and Napa Logistics Park? How much more for the services and infrastructure upgrades that an increased daily population will need? It's not like the County is being flooded by immigrants looking for jobs and homes. The long-term population growth in Napa County is projected to be less than .5%. These building projects are inducing population growth in the county (and the impacts that come with it) so that a handful of developers can make some money. The solution to Napa County's urban problems of traffic and lack of affordable and ever rising taxes and bond measures to pay for increased infrastructure is to stop urbanizing. Develop a general plan created by residents who must live with the results rather than businessmen who profit off it.